A simple curry that allows the flavour of wild mushrooms to shine through. Heat the oil in a deep pan, kadhai or wok and put in the mustard. When it sputters, add the onions and green chillis. Fry until the onions are soft and just beginning to brown. Add the mushrooms along with the remaining spices. Sauté briefly, then add one cup of hot water and salt to taste. Simmer for five minutes, then add the ground coconut and cumin. Cook on low for two more minutes. Remove from heat and add lime juice. 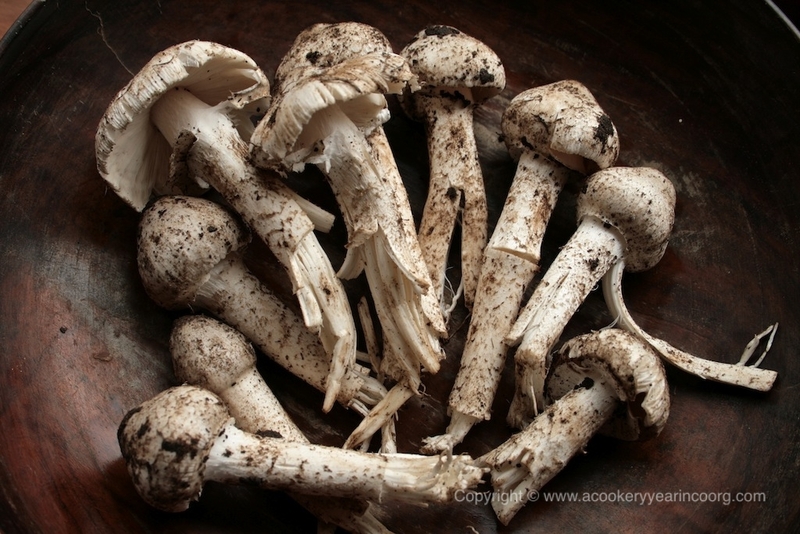 If you don’t have wild mushrooms, here are a couple of ways to make even dull supermarket mushrooms take a walk on the wild side. Drying mushrooms intensifies their flavour and can be done quite easily at home. A friend remembers her grandmother stringing mushrooms on lengths of twine and hanging them to dry above the wood stove in her kitchen in rural Coorg. They had the added cachet of being smoked too!Slice button mushrooms thinly and separate oyster mushrooms into 1 – 2” clumps. Dry in the oven on very low heat or in the direct sun until they are darkened,shriveled and leathery. Store in airtight containers. Soak them in hot water to rehydrate. Use these dried mushrooms and their soaking liquid to make your curry and see if it doesn’t taste just that much better. Shalini, as a kid, I used to enjoy hunting for wild mushroom. The picture used by you in your Kummu Curry recipe featured on http://www.www.coorgrecipes.com is known in Coorg by the name ‘Alandhi Kummu’. Invariably, these mushrooms were found near anthills. I used to be scared of picking up the mushrooms because I was told the anthills were infested with snakes. We used to pluck these mushrooms in large numbers, sometimes basketsful. It was being said that the mushrooms would spring up in the same place and time exactly after one year. Not sure if it was true. There was another variety of wild mushroom I was fond of. It was called ‘Kode Kummu’. Kode in Kodava Thak means umbrella and these mushrooms resembled an umbrella. Normally, these were solitary mushrooms, not meant for a curry, but to be roasted (chutta kummu) on hot coals after sprinkling with a little chilli powder, salt and a squeeze of lime.